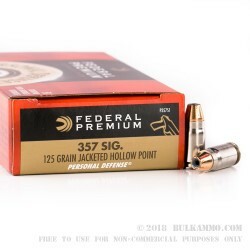 This entry-priced bulk pack of .357 SIG ammo from Federal carries a few premium features that make it a great option for personal protection and everyday carry. 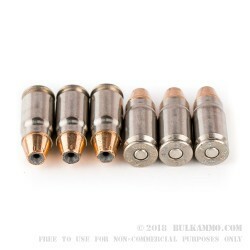 Each cartridge is crafted using a reloadable brass casing that is coated with low-friction nickel for dependable feeding, slick extraction, and resistance to corrosive salts from sweat. The case is fitted with a clean-igniting Boxer primer at its base and a jacketed hollow point (JHP) projectile at its nose. These particular JHPs feature wide-mouth cavities and pronounced jacket scoring. The sum of these build choices is a bullet that expands very widely in order to inflict maximum tissue damage and deliver optimum terminal energy to the vitals of a threat target. 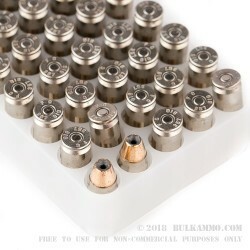 At 125 grains, this load matches the majority of government contract ammunition which by many agencies in both handguns and submachine guns. Federal Premium ammunition is manufactured in Minnesota using in-house components. Their products are supported by nearly a century of experience and are vetted by hunters, competitive shooters, and hobbyists alike.